Although a bit late, I am posting about the current coupon book that is valid in December. 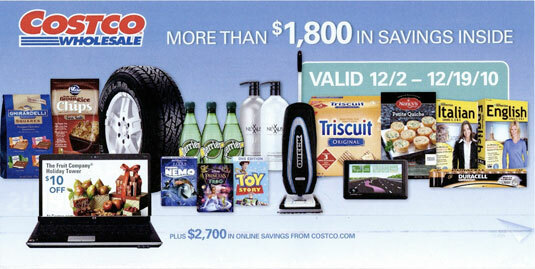 The December 2010 Costco Coupon Book is now available in my Google Docs. It runs from 12/2 to 12/19 and is one of the weaker coupon books in my opinion. There is nothing in this book that I would be encouraged to buy because it is on coupon. The one thing that piques my interest is the Shrimp Scampi, because I haven’t seen it in store in quite a while and it was pretty good last time I had it. The downfall is that my significant other wouldn’t like it, so I’m not going to buy it for myself. Pretty much all stores will have a copy of the coupon book at Membership if you need one. Hope you enjoy and look out for the new alcohol coupons starting in CA, AZ, and NM today!